El Amparo is ideal for short breaks or longer holidays throughout the year. There is a wealth of activities in the immediate vicinity including walking, hiking, skiing, windsurfing, swimming, horseback riding and fishing. Within the Sierra Tejeda National Park are numerous paths and hiking trails and the beautiful lake at Bermejales with its mountainous backdrop is only 20 minutes by car. Here you can enjoy a cooling swim in the crystal blue waters and take lunch at the local restaurants. Because of our proximity to the Washington Irving Trail we offer our guests complimentary use of mountain bikes – and a packed lunch, too, if you wish! You’ll have the opportunity to cycle for miles without having to use tarmac roads. Ideal for those wishing to get out of the rat race! In fact Alhama de Granada and the Hot Springs can be reached on a bike in less than 20 minutes. Maybe longer if you stop at the local tapas bars, or are visiting during the fiesta period. A spectacle not to be missed! For those of you wishing to discover the wider history of southern Spain and the Moorish trails, El Amparo is the place to stay. 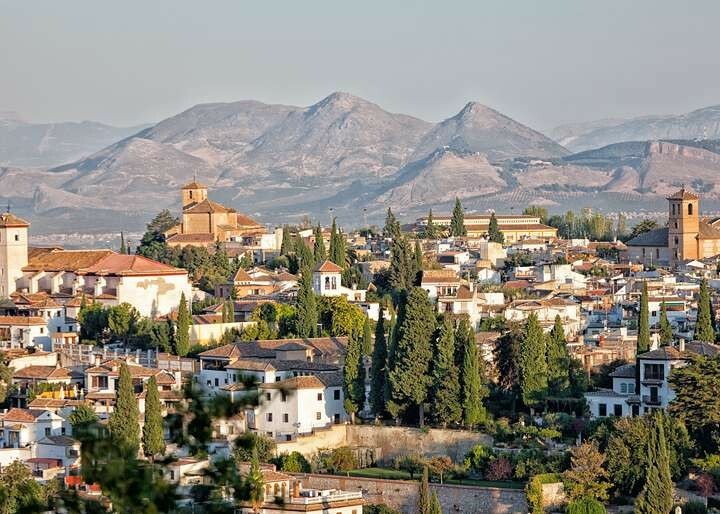 No trip to Spain would be complete without a visit to the cosmopolitan city of Granada. This vibrant town, which is only 30 minutes by car, is a blend of ancient and modern cultures and lies in the centre of Andalucia, the heart of Moorish Spain. This capital city of Andalucia is located on the banks of the Guadalquivir River, some eighty kilometres from where it joins the Atlantic. Wander through its side streets to experience the city or visit the Cathedral and the impressive Giralda tower. 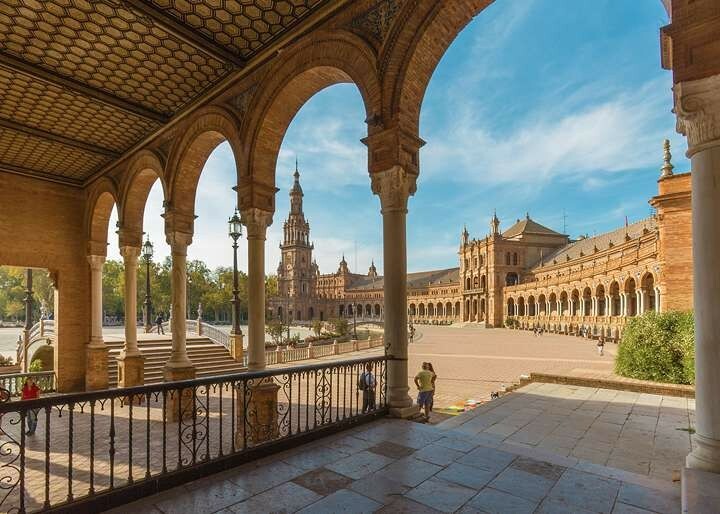 The Alcazar and gardens are a breathtaking example of Moorish architecture and, although a royal palace, better embodies an eastern citadel spanning Islamic and Mudejar Art. The great Mosque at Cordoba is one of the world’s architectural wonders, the most striking example of Islamic art in the west. The symmetry and colours of its columns and arches are stunning. What is unique in the Mezquite is the siting of a Cathedral at the centre of the Mosque, constructed after the reconquest by the Christians in 1236. 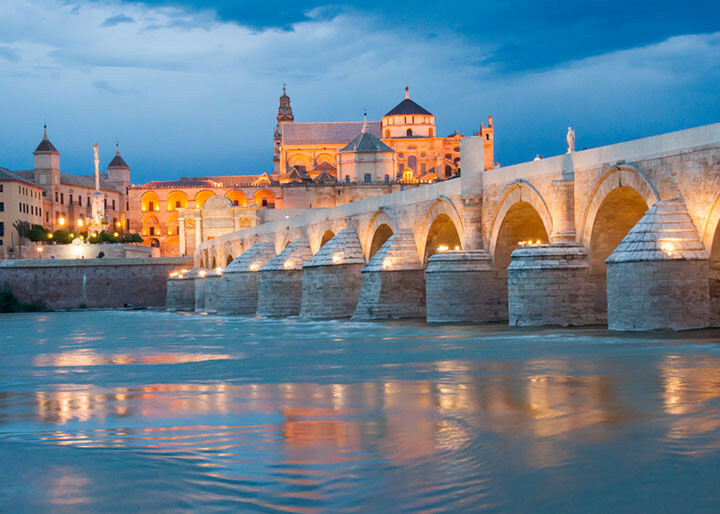 Cordoba has a very compact old quarter, easily accessible on foot for visiting flower-filled patios and narrow alleyways to discover the history of this former capital city. The Garden of the Kings and even the Jewish synagogue are further examples of Moorish design. 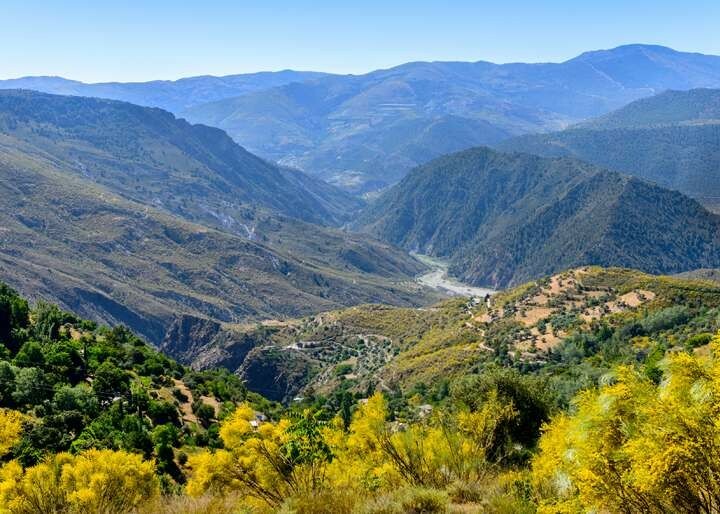 There is a spectacular drive from El Amparo to the coast where the road crosses over the divide between the provinces of Granada and Malaga. Situated on the other side of the Axarquia mountain range is the seaside resort of Nerja. It is a delightful town that has not suffered the high-rise development of other parts of the Mediterranean, but has retained much of its historical centre, with many coves and sandy beaches. Just outside the town are the spectacular caves of Nerja, discovered by accident in 1959. 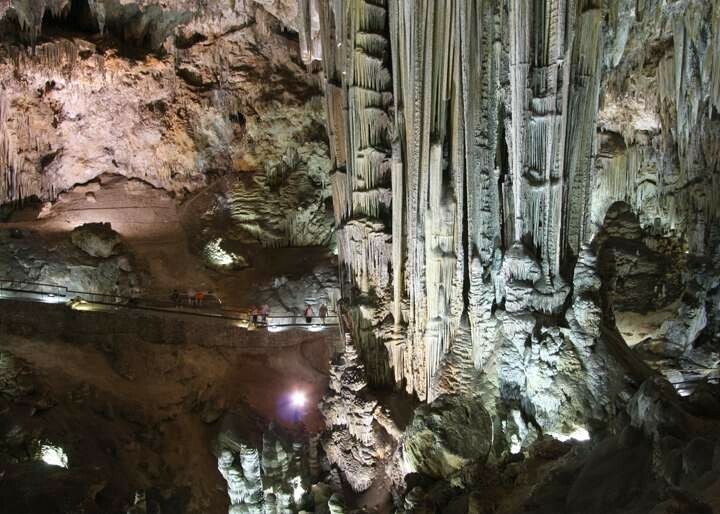 These caves are some of the largest in Europe, measuring over 250,000 cubic metres. Due to the immense size of the chambers and galleries they often play host to concerts and flamenco performances during the summer. 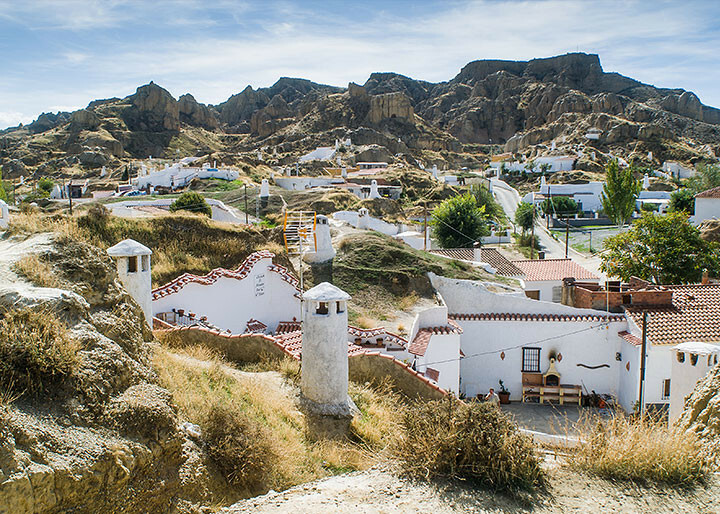 Another town worth mentioning is Guadix, situated to the north east of Granada, and famous for hundreds of cave dwellings which are still inhabited today. Sometimes the only visible sign of inhabitants is the array of television aerials covering an otherwise desolate hilltop. There is also an informative museum showing the history of these dwellings and their attraction even today, being cool in summer and warm in winter. High above the Alhambra and Granada is the Sierra Nevada mountain range, rising to an altitude of 3,480 metres, the highest peak on the Iberian Peninsula. This is the largest National Park in Spain and has a wealth of walking and hiking trails offering stunning views across the city of Granada to the north, and the Mediterranean and North Africa to the south. During the winter months, the Sierra Nevada ski resort above Granada offers outstanding skiing for all abilities.